This is starting to get really fun, more and more and more pictures of ultra cool custom Chopper Motorcycle to look at the think about. 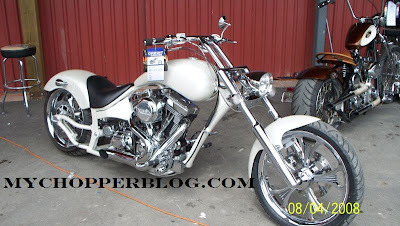 This one is more my style, with the super clean rear end and the hidden softail suspension. I have to have a bike I can ride for 8 hours a day, thus I want a softail. This Bike has a super low seat and a nice line over the top of the tank. You have to like the look or the arched back tiger tank. This line make the engine look good, as I am sure its a big bore horse power monster. The single front down tube looks pretty good, the only thing I have to look twice at and decide if I like is the big long pulled back bars, the long and sloped risers seem a bit funny to me. Maybe if they were a bit shorter or lower, I don't know, what do you think? Top WP Design Theme designed by Swapnil. Design adapted from Sodelicious theme by web2themes.